Thus far, Facebook Places appears to have been relatively successful at bringing location check-ins to the masses. Getting an easy, visual understanding of where in the world your friends are hasn’t really been possible though, until now. 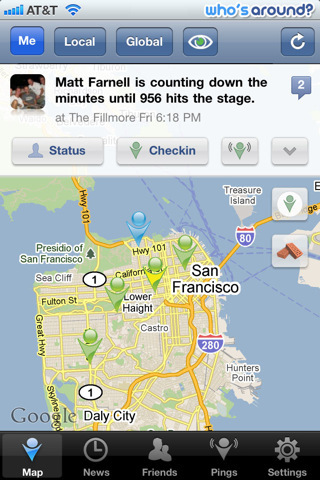 MeMap is a new iOS app that puts your friends’ check-ins on a map that you can explore at will. It displays Facebook Places locations along with any check-ins to apps like Gowalla, Loopt and Foursquare that your friends have cross-posted to Facebook. A traditional timeline view of check-ins and status messages in available, and you can browse your friends to see their most recent check-in. As a bonus, your current location can be shared, Google Latitude style, on the map with other friends using MeMap without you having to check in. This could be especially useful when you’re trying to meet up but can’t quite find each other, although admittedly it’s far from a unique feature. A ‘Panic Button’ allows this data to be wiped if you suddenly realise that your boss is on MeMap and sharing your location from a bar when you’re supposed to be in bed sick probably isn’t a good idea. There’s also a Foursquare-style ranking system built into MeMap, which puts people and places on a chart and awards ‘Swag’ points. Whether the world needs another ‘gamified’ location service is questionable, but MeMap currently tucks this away so you only have to pay attent to it if you’re bothered about playing. MeMap is a simple but effective app that adds a much-needed visual element to Facebook Places and if you and your friends check-in regularly, it’s free to download from the Apple App Store and is worth a look.